The 2011 Golden Globes may be over, however the memories of the demure jewelry that was shown this year still linger. Many of the stars opted to leave their necklines bare, perhaps at the recommendation of their stylists to reflect the recession that we are all feeling. The classic diamond stud was easily found all across the red carpet. 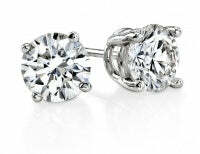 Diamond stud earrings were seen on many different celebrity earlobes. Eva Longoria, for example, showed off a pair of striking 5.00 cttw diamond studs. Other celebrities that could be seen wearing the classic diamond stud included Natalie Portman and Halle Berry, who showed off a pair of diamond studs of 3.00cttw.